At Karam, we believe all children have a right to education - even in a war-zone. We are committed to building bright and confident futures. We are determined to make education accessible for Syria's youth. 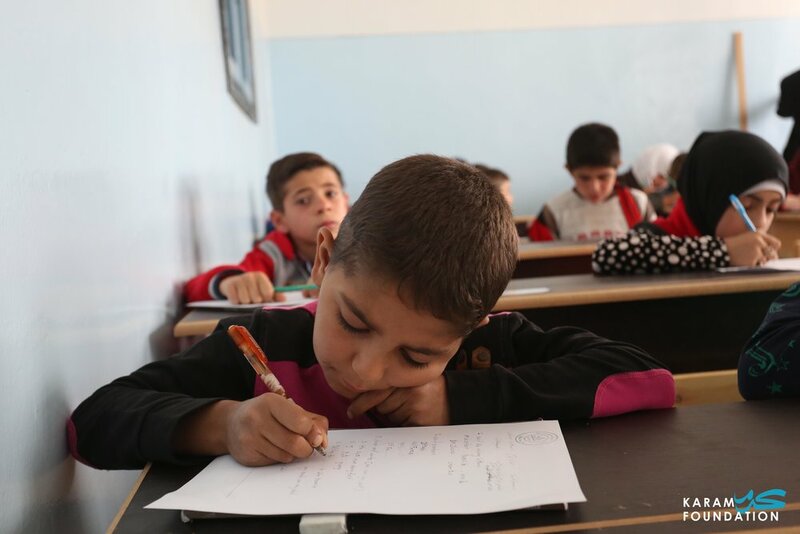 over 6.1 million boys and girls IN SYRIA are in need of education assistance AND AT LEAST 1 in 3 schools are either damaged or completely destroyed. Our Syria School Support program has been educating children in Syria since 2015. Currently, we support 9 schools throughout Syria including Aleppo, Idleb and Rural Lattakia serving 3,325 girls and boys. We believe all students have a right to education, and this program makes sure that happens! karam currently supports 9 schools in syria, serving nearly 4,000 children. WE REBUILD AND REHABILITATE schools that have been systematically targeted by airstrikes and bombardments. This includes everything from physical infrastructure to repainting and electrical networking! We also build outdoor playgrounds so that students have access to physical education - a necessity for their health and psychosocial well-being. WE SUPPORT operational costs of schools inside Syria to ensure that Syrian kids are receiving a quality education. This includes teacher salaries, distribution of student kits, and costs for electricity and sanitation. WE TRAIN TEACHERS and provide necessary support to develop their teaching skills as they are tasked with the challenge to teach in a war zone. Our staff trains educators on different skills including delivering education in emergencies, psychosocial support in schools, and best teaching methods. One of the biggest barriers to accessing education for refugee children are the costs associated with school transportation. Karam Foundation currently sponsors 7 school buses so that Syrian refugee kids can get to and from school safely. Our Refugee School Bus program supports 231 students. KARAM CURRENTLY SPONSORS 7 BUSES, SERVING 231 REFUGEE STUDENTS. In 2016, the Boston Society of Architects (BSA) asked, “what roles can design—and designers—play in aiding displaced populations of the Syrian refugee crisis?” In response to this question, The BSA established the Syria Initiative for Refugee Children. The BSA Syria Initiative aims to address a need for child-focused public space in an effort to improve the quality of life for Syrian refugee families in Lebanon. The initiative is a collaboration of design professionals and students in Beirut and Boston, in partnership with the Karam Foundation, the fiscal agent, and SAWA for Development and Aid, the local NGO on the ground in Lebanon. In the spring of 2018, we completed our pilot playground at a camp in Bar Elias, Lebanon and are currently working on two other projects in the region. The pilot project in Bar Elias has since undergone a post-occupancy evaluation and while it is up and running, and has created great excitement in the community, it needs safety and functionality improvements. We are working with SAWA to implement these necessary changes.